Sulla’s family was of the Roman aristocracy of blood, the patricians, who had formed Rome’s governing class from its earliest days and who still played the leading role in the affairs of the Republic at the time of Sulla’s birth. Sulla inherited the physical and mental traits of his ancestors. 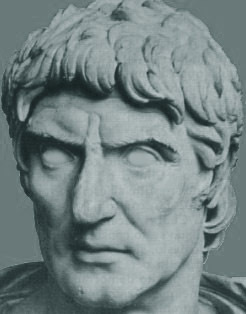 The Greek biographer Plutarch describes Sulla’s blue eyes as “terribly sharp and dominating.” His complexion was ruddy, and his hair was golden blond, which gave him, according to Plutarch, an extraordinary appearance in the Rome of his day, in which the mixing of breeds was already a long-established vice. Sulla’s aristocratic physical traits were accompanied by a boundless ambition to advance to the highest honors which service to the Republic could confer, coupled with exactly that hard-headed pragmatism and will-to-action which had animated Rome’s leaders for centuries. Sulla’s aspirations were scarcely hampered by the humble economic lot which his family, despite its noble origins, endured. The young Sulla was an outstanding scholar. He mastered the arts of rhetoric and debate, so important to an ambitious Roman, and became learned in Greek and Latin literature as well. During his student days Sulla roomed in cheap lodgings, in sharp contrast to the luxury with which Rome’s young aristocrats, already pampered with the spoils of the provinces, were accustomed to surround themselves. Yet even in those days Sulla amused himself in the raucous company of actors and musicians, a pleasure which he was to enjoy to the end of his life. Sulla was successful with women. An affair with the rich but low-born Nicopolis was financially as well as emotionally rewarding, for she left Sulla her estate on her demise. Sulla was adopted by another wealthy woman (an increasingly common practice of the day). He inherited the bulk of her wealth as well. Thereby the young patrician acquired the means without which a successful political career in second-century Rome had become almost unthinkable. Sulla’s entry into public life coincided with a time of renewed tension between two factions which had crystallized 25 years earlier, during the tribunate of Tiberius Sempronius Gracchus: the optimates and the populares. Both groups drew their membership from the Roman upper classes, but they differed radically in their attitudes toward the senatorial oligarchy which had effectively controlled the Roman polity since the origins of the Republic. The faction which, under the leadership of the Gracchi brothers, Tiberius and Gaius, developed into the populares (roughly, “party of the people”), sought to supplant the senatorial regime by appealing to the Roman masses. The senatorial optimates (“the best men”) attempted to circumvent Tiberius’ program for the redistribution of public lands. In their efforts they used a variety of arguments, first appealing to Rome’s unwritten constitution, then to brute force. Tiberius was killed by a mob led by the optimates in 133 B.C., and Gaius and his followers, who had attempted to continue Tiberius’ program, were proscribed (publicly outlawed) by the Senate and hunted down in 122 B.C. The populares, who derived wide support from the Roman lower classes and from the citizens of the Latin and Italian cities subordinate to Rome, were not to be so easily suppressed. Before his death Gaius Gracchus had enlisted the Roman equites to his cause. The equites (“knights”) were so called because in the earlier days of the Republic they had formed a class prosperous enough for each man to supply his own horse and equipment for cavalry service in time of war. By the second half of the second century B.C., however, the equites had long since abandoned their military function and instead made up Rome’s banking and merchant class. Their financial support was increasingly important in the intensifying political struggle, and their resentment at the greater political and social prestige of the senatorial aristocrats was played on by the (likewise aristocratic) leaders of the populares. Discontent with the policies of the optimates in the Senate surfaced with renewed vigor after 112 B.C., when the leaders of the anti-senatorial faction exploited popular discontent with the slow progress of the war against Jugurtha, the usurper-king of Numidia, in northern Africa. Jugurtha, who inaugurated his war against his royal cousin Adherbal by slaughtering the Roman population of Cirta, a city on the edge of the Sahara, was accused by the populares of systematically bribing the leaders of the Roman Senate in order to hinder their war effort against him. Although these accusations were greatly exaggerated, the war in Numidia had dragged on for five years when Gaius Marius was given the command of the Roman armies in Africa, and Sulla was made his quaestor. Marius was a novus homo, a “new man,” as those Romans who were the first of their line to hold consular office were called. He was a natural opponent of the optimates (he had obtained the African command by forcing out the aristocrat Metellus) and an outstanding military leader. In Sulla, at first, he found an able subordinate. Although Sulla seems to have had little prior military experience, he acquitted himself superbly in the Jugurthine War. His duties as quaestor were those of quartermaster and paymaster. In addition, he commanded the Roman troops in Marius’s absence. In a short time, according to Sallust, a first-century Roman historian hostile to Sulla, he became the most skilled soldier in the Roman army. Sulla and the Italian cavalry squadrons which he commanded stood up well against Jugurtha’s troops, both in the hit-and-run raids across the deserts and the foothills of the Atlas Mountains and in the set-piece battles which Jugurtha and his allies undertook in a desperate attempt to end Marius’ scorched-earth strategy. Sulla won the acclaim of the Romans by an exploit which brought the war to its close. Ingratiating himself with Bocchus, the king of Mauretania, Sulla took Jugurtha prisoner at Bocchus’ court, with the king’s approval, although it was a near thing, to the last minute, whether Jugurtha would be surrendered to Sulla or vice versa. Plutarch reports that the popularity which Sulla gained by his capture of Rome’s wily enemy angered Marius and paved the way for the later enmity of the two men. In fact, Sulla served as Marius’ legate in several campaigns during the following years, notably at the great battle of Vercellae in northern Italy in 101 B.C., where the Romans annihilated a great horde of the Germanic Cimbri and their Celtic allies. While Marius gathered the lion’s share of the honors for his victories over the Germans, including an unprecedented four consecutive consulships, Sulla gained valuable military experience in other campaigns against the Gallic tribes north of the Roman province of Narbonensis, in southern France, and against the untamed tribes of the Alps. The mortal rivalry with Marius would only explode several years later. In 98 B.C. Sulla was elected praetor, the Roman official in charge of the administration of the Republic’s laws. In the following year Sulla was sent to administer the Roman province of Cilicia in Asia Minor. At that time the neighboring province of Cappadocia, to the north, was in ferment as a result of the expulsion of the pro-Roman King Ariobarzanes by Gordius. Gordius was suspected to be the pawn of King Mithridates of Pontus, who was gathering his forces for an eventual challenge to Rome’s overlordship in the east. Sulla crushed Gordius, restored Ariobarzanes, and then achieved a diplomatic coup by opening relations with the Parthians, who were creating an empire on the Iranian steppes. Sulla made clear by his conduct during his interview with the Parthian ambassador Orobazus that the Roman Republic was the superior power, seating himself between and above the Cappadocian king and the Parthian envoy. He was showered with popular applause when he returned to Rome. Shortly after his arrival in Rome Sulla was charged by Censorinus, a member of the populares, with corruption and extortion in Cappadocia. Such accusations against members of the senatorial faction had become commonplace after Gaius Gracchus’ institution of courts to try provincial administrators accused of malfeasance, since these courts were composed exclusively of equites. Naturally, those governors who showed the greatest care in protecting their colonial subjects from the depredations of Roman merchants and tax-farmers, almost all of them equites, were most likely to be indicted. Censorinus’ accusations were flimsy, and he failed to appear in court on the appointed day. Nevertheless, Sulla had been served notice that the populares considered him a dangerous enemy. In 91 B.C. a large number of Rome’s Italian allies revolted against Rome’s hegemony on the Italian peninsula. The rebellion was triggered by the assassination of the tribune Marcus Livus Drusus, who had alienated both the optimates and the equites by attempting to enfranchise the Italians. Both Marius and Sulla served as generals in the campaign against the rebellious allies, which came to be known as the Social War (socius being the Latin word for ally). Sulla proved himself as skilled a general as Marius, and even more energetic. His leadership was decisive in quelling the uprising, as was Rome’s magnanimous grant of citizenship to those Latins and other Italians who surrendered their arms to Rome. Scarcely had the Romans overcome the threat on the peninsula when Mithridates launched an attack against the Romans in Asia Minor unprecedented in its scope and ferocity. At least 80,000 Romans, most of them bankers and tax gatherers, were butchered throughout the cities of Asia Minor. The Roman military forces were overwhelmed, and Greece and Syria were drawn into the revolt. The question of who was to lead the Roman armies to restore the situation in the east touched on more than military and foreign affairs. Even more than the great prestige which would be conferred on such a leader, the army he would command might be a powerful weapon in the factional strife which was always simmering in Rome. It was Sulla whom the Roman people chose for the command, after he had been elected consul for that year. Marius, enraged at having been passed over, allied himself with the unscrupulous tribune Publius Sulpicius Rufus. Sulpicius, who had formed a band of young toughs, recruited from the equites, which he called his “anti-Senate,” obliged Marius by unconstitutionally revoking Sulla’s appointment and naming Marius to command the Asian expedition. Sulpicius then unleashed his supporters on the optimates, killing hundreds of them and forcing Sulla to flee for his life to his forces at Nola, 130 miles southeast of Rome. Sulla reached the encamped legions in advance of the officers whom Sulpicius and Marius had dispatched to inform the men of the change in command. The army rallied to Sulla, stoned Marius’ staff officers, and marched on Rome. Enroute Sulla and his men were met by Servilius and Brutus, two of the praetors, who beseeched Sulla not to outrage precedent by violating the sacred boundaries of the city. Even as they spoke, Marius’ supporters were embarking on a new slaughter of the aristocratic faction. Sulla disregarded the pleas of the praetors and advanced on Rome, after first deceiving the delegates from the city into believing that he intended to halt outside the gates. Two of his subordinates led an advance force into the city, and Sulla followed with the remainder of the legions. After a brief but bitter street fighting, the Sullan army gained the city. Marius made a brief attempt to rally Rome’s slaves to his cause by offering them their freedom, but to no avail. He fled Rome, eventually reaching safety in Africa. Sulpicius Rufus was slain, along with numerous followers. Despite their salvation from the populares, many senators were displeased with Sulla’s uncompromising measures. His preeminence boded ill for the principle of collegiality which the oligarchy swore by. There were, as well, a large number of populares remaining. Although they found it prudent to veil their sympathies for the moment, they stood ready to resume the struggle for the mastery of Rome on Sulla’s departure. Thus it was that the Roman people elected magistrates hostile to Sulla. Foremost among them was Lucius Cinna, from whom Rome’s aristocrats would later endure heavy losses. Sulla swallowed whatever anger he felt at the elections, since the situation in Asia was deteriorating rapidly. He decided to deal with Rome’s foreign enemies first. Greece had largely embraced the cause of Mithridates in the first flush of his success, seeing in his victories an opportunity to regain the freedom they had lost to Rome in the preceding century. Nonetheless, the Hellenes affected to greet Sulla warmly, doubtless remembering the ruthless measures his predecessors had taken in 146 B.C., when the Romans had razed Corinth. Alone of the Greek cities, Athens held out against the Romans, defended by its tyrant Aristion. Sulla invaded the proud city, battering at the walls with all the complex machinery of ancient siege warfare. To finance the vast quantities of material needed for his operations Sulla hit upon the sacrilegious plan of approaching the rich treasures dedicated to the gods at Olympia, Epidaurus, and Delphi. The Greeks at Delphi were understandably horrified by Sulla’s intentions; his emissary, Caphis the Phocian, returned with the word that the guardians of the temple had heard Apollo’s lyre sounding from the inner shrine. Sulla laughed off this portent. Wasn’t music a sign of joy, rather than anger? Evidently the god was delighted at the prospect of Sulla overseeing his wealth. The treasures were duly confiscated and sold to further the siege of Athens. After the discovery of a weak point in the Athenian defenses, Sulla’s forces stormed the city, inflicting great carnage on the inhabitants. Meanwhile Taxiles, one of Mithridates’ generals, was moving south from Thrace and Macedonia with seemingly overwhelming forces. Sulla marched quickly from Athens to the open country of Boeotia, north of Attica. At Philoboeotus he joined forces with the Roman general Hortensius, who had advanced southward from Thessaly just ahead of Taxiles’ armies. At Philoboeotus the entrenched Romans confronted over 100,000 of the enemy, chiefly Medes and Scythians, although Greek mercenaries constituted the backbone of Taxiles’ force. The Asiatic army outnumbered Sulla’s forces by five to one. Sulla decided to wait Taxiles’ troops out, counting on the superior Roman discipline to hold, while the barbarians, unaccustomed to a war of position rather than of movement, grew restless and relaxed their guard. Sulla’s strategy bore fruit. After several days of preparation he launched his attack against an enemy that had begun to rove around the countryside, engaged in disorderly foraging and plundering. A detachment of Sulla’s Greek allies from the Boeotian town of Chaeronea managed to gain a height above and behind the enemy, inflicting first panic and then heavy losses on the Scythians below them. Sulla’s troops pressed forward relentlessly, and the scythe-wheeled chariots on which Taxiles had counted whirred harmlessly past them. Even so, it was a difficult fight. More than once the vastly superior numbers of Mithridates’ army seemed about to overwhelm the Romans, but each time Sulla shifted the right wing, which he commanded personally, to the critical point. Finally the enemy lines buckled for the last time, and the Romans gave pursuit, inflicting great slaughter. No sooner had Sulla defeated Taxiles than he received word that Flaccus, a supporter of Marius, was moving toward him with an army ostensibly meant to reinforce him, but more likely with secret orders to attack him. At the same time, a large army of Mithridates’ picked troops, commanded by Dorylaus, landed at Chalcis and swarmed into Boeotia. Once again Sulla confronted a large Asiatic army in Boeotia, this time on the plain of Orchomenus. Here the enemy refused to fall prey to Sulla’s waiting game. Dorylaus attacked at once and sent the Romans legionaries reeling. Sulla leaped from his horse, seized a standard, and pushed forward through his fleeing men, shouting, “As for me, Romans, I can die here with honor; but as for you, when you are asked where it was that you betrayed your commander-in-chief, remember and say: ‘It was at Orchomenus,’” Sulla’s example rallied his men, and in three sharp engagements the Romans all but annihilated Mithridates’ second invading army. The victory over Dorylaus came at an opportune time. Reports from Rome were reaching Sulla of renewed and bloodthirsty campaigns by the populares against his own senatorial party. His wife Metella had been forced to flee with her children. She joined Sulla with the news that his opponents had burned down his houses and villas. Sulla opened negotiations with Mithridates’ general Archelaus at Delium. He haughtily rejected Mithridates’ offer of an alliance and advanced across the Hellespont to Dardanus on the Troad. There Sulla and Mithridates negotiated a treaty obliging the king of Pontus to withdraw from all the lands he had invaded and to pay a large indemnity to the Roman Republic. Sulla was roundly criticized for letting so relentless an enemy of Rome escape on such easy terms. Yet Sulla and what remained of the senatorial class in Rome were in mortal danger. Cinna and his chief henchman, Gnaeus Papirius Carbo, had solidified their hold on Rome by a reign of terror. In Greece, Flaccus’ army, now commanded by Fimbria, menaced Sulla. Sulla advanced to Thyateira, where Fimbria’s forces had encamped. Such was Sulla’s popularity that large numbers of his opponent’s men began to desert to him. Fimbria, confronted with the inevitable, took his own life. Sulla stopped at Athens once more, where he confiscated a large library containing excellent editions of Aristotle’s works, and then marched across Greece to Dyrrachium. From there he embarked for Italy. Sulla landed with his army at Brindisium, on the heel of the Italian boot, in the spring of 83 B.C. He faced grave strategic problems, for his Roman enemies outnumbered him heavily. His own troops’ term of service had elapsed, and there was no guarantee that they wouldn’t simply go home. Furthermore, the populares were bolstered by the fanatical support of the non-Latin peoples, particularly the hardy Samnites and Lucanians, still unreconciled to their enforced subordination to Rome. Sulla easily obtained his men’s enthusiastic allegiance, declining a large gift which they subscribed to him. Their spirit stood him in good stead. After the landing Sulla led his troops to victory against the consul Norbanus, driving him and the remnants of his forces across the Apennine passes to Capua. Sulla’s lieutenant Lucullus routed another army of the populares at Fidentia. Sulla moved slowly up the peninsula, gradually but steadily augmenting his forces from the mounting defections which plagued the armies of the populares. His enemy Carbo, foreshadowing Machiavelli’s terms, remarked that in making war on Sulla he had to deal with a man who was at heart both a lion and a fox, and the fox was more worrisome than the lion. Advancing northward, Sulla defeated the son of his old patron and later enemy, Marius, in a pitched battle at Sacriportus. Sulla’s generals, among them Pompey and Crassus, who later formed the first triumvirate with Julius Caesar, annihilated the remainder of Carbo’s forces, and Carbo fled to Africa. Just before Rome, at the city’s Colline gate, Sulla fought his last battle. The enemy, most of whom were Samnites led by the embittered anti-Roman Telesinus, fought desperately, and the outcome was in doubt through the night. Sulla, reinforced by Crassus’ troops, managed to drive the enemy to Antennae, where he set them one against the other by an offer of clemency to one of their legions. After their surrender, Sulla had them all dragged to the Circus at Rome, where he commanded that they be mercilessly slaughtered. Sulla recognized that his military victories over the populares would not be sufficient to destroy the threat they posed to the Senate’s control of Roman political life; the remainder of the Marian faction had to be rooted out and destroyed. To that end Sulla instituted a brutal and thorough purge of the leading populares and their supporters among the equites. As the captive Samnites were being cut down in the Circus, Sulla’s partisans were already making their bloody rounds among the men who had backed Marius and Cinna. Sulla’s men were without scruple; among them were many former populares, who now turned their murderous attentions to their erstwhile companions. At least 1600 equites were slain and as many as 40 senators. Their property was appropriated by Sulla, to be handed out to his friends and operatives. After crushing the populares, Sulla staged an impressive triumph to commemorate his victories over Mithridates. Garlanded patricians, newly returned from exile, added to the solemn dignity of the procession. At the close of the ceremony, Sulla addressed the Roman people, and publicly assumed the surname Felix (“the Fortunate”), in recognition of the tie which binds every great man with fate and destiny. Sulla’s proscriptions appalled many optimates, who had previously hurried to acclaim him as their savior on his triumphant return to Rome. With the open danger banished, the members of the senatorial class – like conservatives in every age – showed themselves all too willing to carry on the affairs of state on the basis of an idealized vision of the past rather than facing the stern demands of the present and future. Sulla had no intention of allowing the class and system of government which he had restored to fall victim to its own squeamishness. Since both consuls were dead, he brought about the appointment of an interrex (interim king, an office harking back four centuries to the days of the monarchy). As had been arranged, the interrex, acting under the provisions of a special law, proclaimed Sulla dictator for an unlimited term to enact legislation and to reorganize the Republic. Sulla, the first Roman dictator since the dark days of the second Punic War 125 years before, fulfilled with scrupulous punctilio the duties with which he had charged himself. He introduced changes which greatly reduced the opportunity for unscrupulous politicians to appeal for the support of the urban rabble, and he limited the legislative powers of the tribunes, who drew their mandate from the popular assembly. Furthermore, he barred tribunes from holding any future offices, which deterred ambitious Romans from using the tribunate as a stepping stone to higher office. Most unpleasantly for the rapidly increasing proletarian idlers of Rome, Sulla eliminated the corn dole. At the same time Sulla took positive steps to strengthen the Senate. He increased its numbers from somewhat fewer than 300 members to 600, thereby more than making up, at least in quantity, for the senators who had fallen to the populares. In addition Sulla clarified and reformed the procedures by which one might be selected to the magistracies. A sizable interval – ten years – was mandated for men seeking to hold office they had previously held. Furthermore, Sulla attempted to put a stop to abuses of provincial commands by regularizing the process by which retiring magistrates were appointed to govern the provinces. Sulla’s institution of a system of permanent courts to deal with criminal offenses was an innovation which eventually formed the basis for much of Europe’s system of criminal justice. After serving as dictator for a year, then as consul, Sulla relinquished any claims to political power and became once again a private citizen. He retired to his estate in Campania, north of Naples, where he occupied himself in writing his memoirs, which have been, most unfortunately, lost to posterity. In 78 B.C., little more than a year after his retirement, he died a painful death from cancer. Sulla’s funeral in Rome was the most elaborate conducted for any Roman citizen to that day. His bones were buried on the Campus Martius, the burial ground of the Roman kings. His tomb bore an inscription to the effect that no man did more to help his friends or to hurt his enemies. Sulla’s reforms were not enough to save the Republic. They dealt primarily with the political manifestations of deep-seated social, and ultimately racial, problems. Then, too, he was the last man of stature that the optimates produced. After his demise, even former Sullan lieutenants like Pompey and Crassus sought the personal aggrandizement to be gained by cultivating the support of the equestrian financiers and urban masses. Sixty years after his death Rome was a Republic in name only. It could be argued that Sulla’s task was a hopeless one, that he was defeated before he started by the racial miasma into which the Aryan founders of Rome were well in the process of being drawn. Even if that be true, Sulla deserves to be remembered as one of the great White statesman and soldiers of all times, whose courage and guile on behalf of his race’s elite never failed him, truly a man with an iron heart.